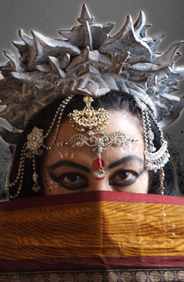 Rakini Devi is a dance artist whose work can be described as hybrid theatre/performance art. She often includes text, her own visual art, film, and original music. She has collaborated with artists from diverse practices who share her interest in creating art that challenges our notions on race, culture, social issues and new technologies. Born in Kolkata of Indian and Burmese parents, Rakini trained in two forms of Indian Classical Dance before she began her exploration into cross-cultural dance techniques. Her solo performances have been presented in the US, Canada, Japan, India, Indonesia and South Africa as well as nationally throughout Australia.